Simultaneous improvement in handling, comfort, noise and rolling resistance resulting in good handling, quiet ride and reduced fuel consumption. Accurate fit and rounder shape for a smooth and uniform ride. Resistance to tread surface abrasion, chipping and reduced heat generation for longer tyre life. Water dispersment for good wet handling and resistance to aquaplaning. 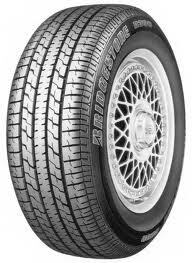 Tyre uniformity and high speed durability.